Pattern colour: Elytra black with variable yellow spot at the apex and a yellow area along the front half of the outer side. Pronotoum: Black, usually with a fine yellow front margin, and a yellow spot at the hind angles. Leg colour: Orange-yellow, femora darkened; legs sometimes darkened more extensively. Status: Widely distributed, especially in southern England. Habitat: Short herbaceous stands on calcareous soils. Host plant: Mainly Slender St.John's-wort (Hypericum perforatum), but also other species. 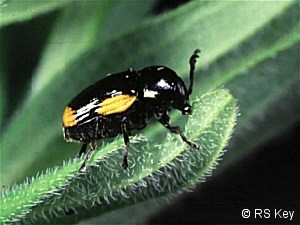 Food: Adults feed on leaves & flowers of host plants.